Born on 16 March 1888 in Ottawa, Ontario - son of Mrs. J.E. Parker, Ottawa, Ontario - at the time of his enlistment in 1915: trade as manufacture; single; currently a lieutenant with the Governor General's Foot Guards; no previous military service. 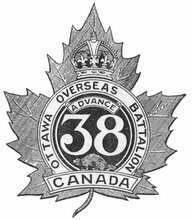 Joined the 38th Battalion, CEF, as a lieutenant in Ottawa, Ontario, on 8 February 1915 - [then] - joined the Canadian Machine Gun Corps, CEF, on 19 March 1917. Awarded the Bar to the Military Cross.